Ushering in a new era of advanced Global Positioning System (GPS) technology, the U.S. Air Force declared the first Lockheed Martin-built GPS III satellite "Available for Launch." The Air Force's "AFL" declaration is the final acceptance of Lockheed Martin's first GPS III Space Vehicle prior to its expected 2018 launch. 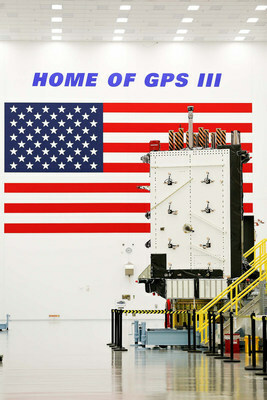 GPS III SV01 will bring new capabilities to U.S. and allied military forces, and a new civil signal that will improve future connectivity worldwide for commercial and civilian users. Lockheed Martin’s GPS III satellites will have three times better accuracy and up to eight times improved anti-jamming capabilities. Spacecraft life will extend to 15 years, 25 percent longer than the newest GPS satellites on-orbit today. GPS III’s new L1C civil signal also will make it the first GPS satellite broadcasting a compatible signal with other international global navigation satellite systems, like Galileo, improving connectivity for civilian users. Lockheed Martin is focused on providing the Air Force an affordable, resilient, low-risk GPS III solution. As new technology emerges, or as the Air Force’s mission needs change, Lockheed Martin’s unique GPS III satellite was designed with a flexible, modular architecture to allow for the straight-forward, low-risk insertion of new capabilities. The satellite’s design already incorporates the Air Force’s next GPS III satellite acquisition requirement for a Laser Retro-reflector Array and Search & Rescue payloads. Both of these were proven to preliminary design levels in 2013 and significant strides have already been made for Regional Military Protection (RMP). Additionally, all future Lockheed Martin GPS III satellites have validated compatibility with the next generation Operational Control System (OCX) and the existing GPS constellation, significantly mitigating risks from adding GPS III to the constellation. Today about 60 percent of the current GPS constellation is made up of Lockheed Martin-designed and built GPS IIR satellites, which began launching in 1997, and the first M-Code capable GPS satellites, the GPS IIR-M, which began launching in 2005. Lockheed Martin is proud to be a part of the Air Force’s GPS III team. More than 250 aerospace industry companies from 29 states support us on GPS III. The Atlas 5’s first stage was stacked on top of a mobile platform inside the Vertical Integration Facility at Cape Canaveral’s Complex 41 launch pad early last week. It was to be followed by the hoisting of the Atlas 5’s Centaur upper stage and a single strap-on solid rocket booster. The first Atlas 5 launch of 2018, and the 75th overall, will propel the Air Force’s fourth Space Based Infrared System satellite toward a perch in geostationary orbit approximately 22,300 miles (35,800 kilometers) over the equator. Liftoff Jan. 18 is set for approximately 7:40 p.m. EST (0040 GMT on Jan. 19) at the opening of a 40-minute launch window. The SBIRS GEO Flight 4 satellite, built by Lockheed Martin, will join three others launched since 2011 to provide early warning of missile launches heading for the United States and its allies, including those potentially carrying nuclear weapons. The launch will complete the deployment of the initial SBIRS fleet, comprising four geostationary satellites with scanning and staring infrared sensors providing global coverage, and four piggyback infrared telescopes carried by classified National Reconnaissance Office spy satellites in oval-shaped orbits suited to detect missiles flying over the North Pole. 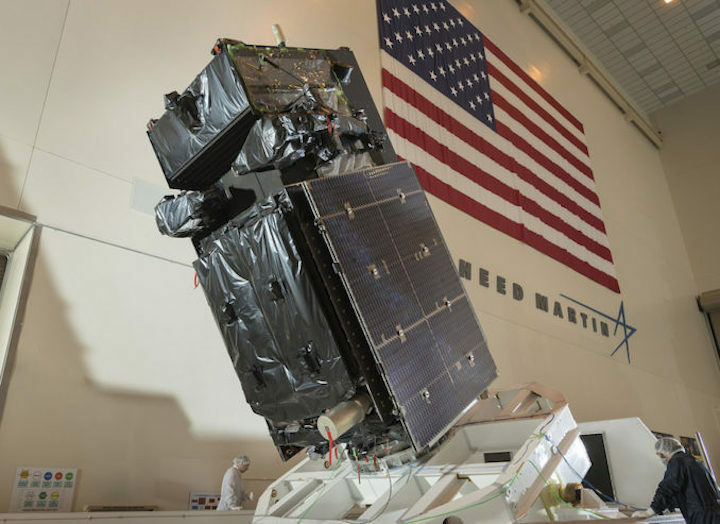 The Air Force has ordered two additional SBIRS geostationary spacecraft from Lockheed Martin for launch in the early 2020s. The SBIRS early warning network follows the Air Force’s Defense Support Program satellites, which began supplying missile detection services to the U.S. military in the 1970s. The SBIRS satellites can also register other bright infrared emissions coming from wildfires, meteors, satellite re-entries nuclear detonations. “The delivery, launch, and successful operation of GEO Flight 4 will mark the fulfillment of the original SBIRS baseline constellation and reaffirm our commitment to provide our country, warfighters, and senior leaders with timely, reliable, and accurate missile warning and infrared surveillance information.” said Lt. Gen. John Thompson, commander of the Air Force Space and Missile Systems Center and Air Force program executive officer for space. The SBIRS GEO Flight 4 satellite arrived at Cape Canaveral on Oct. 31 after a cross-country flight aboard an Air Force C-5 Galaxy cargo plane from its Lockheed Martin factory in Sunnyvale, California. After completing post-shipment tests and other customary checks on the satellite, officials gave the go-ahead earlier this month to begin fueling the spacecraft with maneuvering propellant. The on-board fuel is required for the satellite to climb into its final circular geostationary orbit after a drop-off by the Atlas 5 rocket in an elliptical transfer orbit, then to keep the spacecraft operational throughout its 12-year design lifetime. Once technicians finish fueling the satellite, it will be fixed to the Atlas 5’s payload adapter and enclosed inside its nose cone, then transported to the Complex 41 launch pad for attachment to the rocket. The three previous SBIRS geostationary satellites launched in 2011, 2013 and in January aboard the basic “401” version of ULA’s Atlas 5 rocket, which does not use any solid rocket boosters. SBIRS GEO Flight 4 will launch with the Atlas 5-411 configuration, with a single solid rocket booster and a four-meter-diameter (13.1-foot) payload fairing. The change will allow the Centaur upper stage to make a controlled de-orbit and re-entry after it releases the SBIRS GEO Flight 4 satellite, a measure to prevent the flight from adding to space debris in Earth orbit.